The worst thing about our dinner tonight was my photography. I'm fine with that because everything tasted so damn good. The older spawn was out with his friends and the young'n was spending the night at his buddy's so it was just Alexis and me. So we went with something simple and quick. 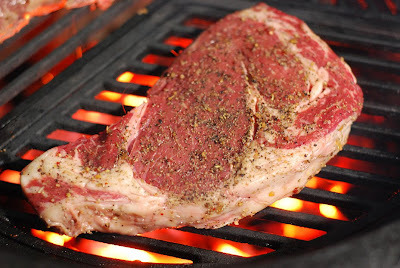 Grilled ribeye steak on the Big Green Egg using a Craycort cast iron grate (a product by one of our fellow BBQ Brethren). 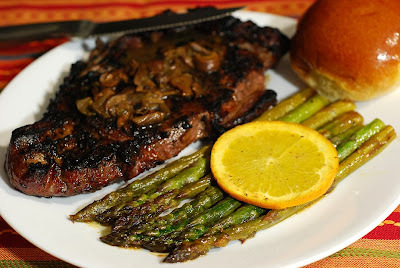 I made up an easy but great mushroom sauce for the steaks. I was going to make a mushroom cream sauce but looking at the mushrooms reconstituting in the beef stock steered (beef pun intended) me in a different direction. Make the sauce while your steaks are resting for 10-15 minutes after grilling. 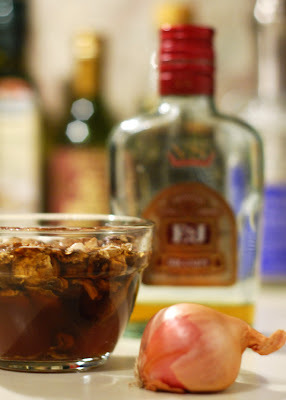 Reconstitute the mushrooms in the beef stock for 30 minutes. Remove the mushrooms from the stock (reserve stock) and chop. In a hot saute pan, melt 2 Tbsp of the butter and saute the shallot over medium high heat for about 1 minute. Add the chopped mushrooms and saute another 2 minutes. Add the stock and simmer until the volume is reduced by half. Stir in 1 Tbsp of butter and remove from heat. Serve over steaks. Whisk together the juice, ginger, mustard, salt and pepper. Slowly add the oil while whisking rapidly to create an emulsion. 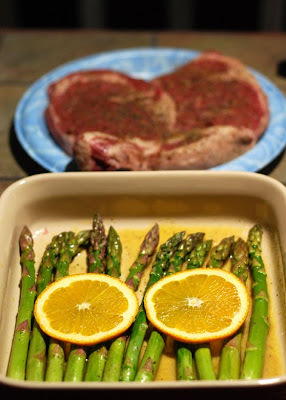 Place the dish on the hot grill as the steaks come off. The food was spot on perfect. I was so glad that I went with using the stock instead of the cream on the mushroom sauce. Impulsive inspirations can be a good thing. 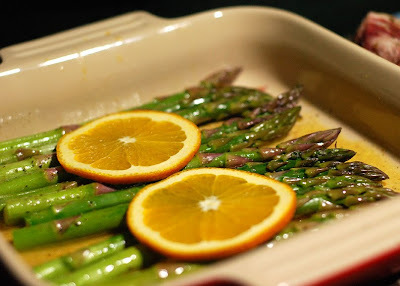 The asparagus recipe was not only packed with "both ends of the spectrum flavor", it also adapted easily to the grill. Sigh....roll me in bacon and put me to bed, I'm content. PS: Never try that last line in a singles bar....it never works.